Hello again, I wrote to you last month about my new pool looking funny after install. Now there are deep craters along side of the supports inside the pool on the pool floor where the supports are showing through the liner. The supports show under the liner on both sides. They are sending out someone to look at this mess and I want it fixed correctly the first time. So, I was wondering if you have any idea what could have caused this and what is the remedy? Thank you sooo much for helping me and lots of other people! Hi. What I am seeing is the straps that bolt to the fronts of the brace channels. The channel is normally a U shape and it's easy for dirt to work its way up and under the channel causing the sand to collapse in this area. It appears the liner may be directly on the metal pool parts which is a very dangerous situation. 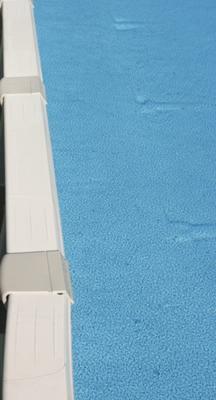 Most pools now days, since this problem has been going on for years, provide foam fillers that are used to cap off the ends of the fillers. These were either not provided or not used. If they were not provided some provision must be made for packing enough dirt in and around this area so this does not happen. to do about it. Hopefully the company will stand behind there work or you possibly have some leverage. I'm sure they will try to use the same liner as new ones are expensive. The thing is, they need to be really good to make this kind of repair and reuse the same liner, and leaving it looking half way decent. My approach would be to lower the water level down to about an inch. 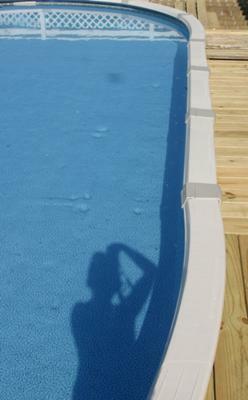 I want enough water in the pool to hold the liner in place. I do not want the liner to shift or shrink. I would have helpers hold the liner back, one side at a time, while I made the repairs. I would plug the channels and add sand, or whatever was needed. I would then smooth the side and reset the liner. The next side would be the same then the pool would be refilled. This is assuming there is sufficient sand, or whatever pool liner cushion was used, to adequately cover the rest of the pool area. The pressure plates and all the side support system stuff needs to be well covered. None of that metal should be anywhere close to your pool liner. If the entire pool needs more sand you really need to be careful. It is highly unlikely they will be able to remove the liner and reinstall it as nice as it looks now. It's possible, just very unlikely. If the entire base needs redone I would hope they would install a new liner. Hope is all works out, please let us know. Here's a summary of my problems. 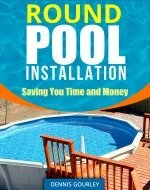 I had my pool installed May 11th & 12th. Immediately after it finished filling we noticed that the side rails were leaning out and the side rails are not level, not equal distance and the screw holes don?t match up. Therefore, screws were either not used at all or they were forced on, cracking & distorting the caps. Also, we immediately could see the supports in the pool poking through the liner, resulting in sink holes and my new liner resting directly on the metal supports. The steel structures are not straight up & down/level & the measurements are not correct or consistent (should be 42" on center). The installer came back to look at this & told me that the ground settled because we had a pool there prior & 9 out of 10 installed pools after the 1st have this problem & also blamed all the rain we've been getting (even though they were poking through right after we filled it & no rain at all. Also, my side rails are not level at all (tilted away from pool) & the big side supports are not straight up & down (also leaning away from pool) Installer said that happens because the water shapes the pool & it's normal for them to move because of the water pressure. He wants to pull the liner back & put foam over the unsettled parts & then re use the liner. By the way he told us to drain the pool all the way. All this without a new contract or anything in writing! I said no way we need to sort this out and write it up. Not Happy:( (those foam plugs were supplied not sure if used)here are more pics. Any thoughts? Hi. He is blaming a lot of different things for a pool that was just plain poorly installed. If, for any reason, the ground was unstable the pool should not have been put up. Unstable ground is easy to fix, before the installation. 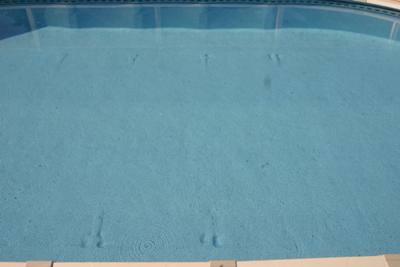 The water only shapes a pool if it was poorly installed. Otherwise the pool fills up to a perfect shape, and the sides stay straight because the braces and the blocks under them were all leveled perfectly. I don't like his method of fixing it, but if he promises to come back and redo it, if you are not happy, you might let him have a shot at it. I think he will learn real fast that completely draining the pool is not the way to go about it. Hi The wall coming out of the bottom rails is, more often than not, a leveling problem. When the pool is level the wall stays in the track.